A lawyer by day-and then only when he's forced to take on new cases-Andy Carpenter's true passion is the Tara Foundation, the dog rescue organization he runs with his friend Willie Miller. So it's frightening when Willie calls him to say the alarm has gone off at the foundation building, and there's clearly been a break-in. It turns out that a recently rescued dog, nicknamed Cheyenne since her arrival at the foundation, has been stolen. Andy and Willie track the missing dog to a house in downtown Paterson, New Jersey and sure enough, they find the dog...standing right next to a dead body. The man had been gruesomely murdered mere minutes before Andy and Willie arrived. Could it be a coincidence? Or could the dog theft somehow be connected to the killing? Andy takes Cheyenne safely back to the foundation building, and that should be the end of his involvement, but Andy's curiosity-and his desire to keep the dog from further harm-won't let him stop there. The cops have just arrested a man named Tommy Infante for the murder, but as Andy looks into the circumstances surrounding the break-in and the dog theft, he starts to wonder if Infante might actually be innocent. And when Andy takes Infante on as a client and starts searching in earnest for evidence that will exonerate him, what Andy starts to discover terrifies him. The murder might be just one small cog in a plot with far-reaching implications, and unless Andy can uncover the truth in time, thousands of lives could be in imminent danger. 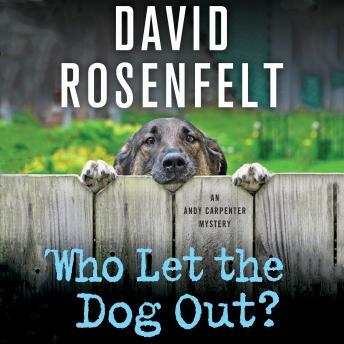 Once again David Rosenfelt has written a fast-paced and clever mystery with his characteristic blend of humor, larger-than-life characters, and propulsive plotting. Fetal. Proposal Andy Carpenter as usual at his best.